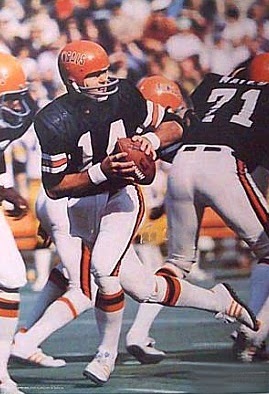 Anderson, who was well-regarded despite coming from a small college, was chosen by the Bengals in the third round of the 1971 NFL draft, and took over as starting quarterback in his second season. Mobile, intelligent, and with a good arm, he also adapted well to QB coach Bill Walsh’s early version of the West Coast passing attack with short timing passes. He broke out in 1973, throwing for 2428 yards and 18 touchdowns with a passer rating of 81.2 while the Bengals went 10-4 and won the AFC Central title. Bengals went 7-7 to finish third in the AFC Central while leading the conference in passing yards (2511). Anderson again led the NFL in passing (93.9 rating), passing yards (3169), and yards per attempt (8.4) in 1975 and was selected to the Pro Bowl in ‘75 and ’76. The team regularly contended during that period, but through coaching changes and attrition, the Bengals slumped later in the decade and Anderson, who also battled injuries, even briefly lost his starting job during the 1980 season. He came back with a MVP performance in 1981 in which he led the NFL with a career-high 98.4 passer rating and Cincinnati won the AFC Championship. Anderson again led the NFL in passing during the strike-shortened 1982 season (95.3) and completed a then-record 70.6 % of his passes. He led the league once more in completion percentage in ’83 (66.7) but after one last year as the starting quarterback, he backed up Boomer Esiason in 1985 and ’86, his last two seasons, all spent with the Bengals. Overall, he passed for 32,838 yards and 197 TDs, averaging 7.3 yards per attempt. He also rushed for 2220 yards and 20 touchdowns. Anderson was a consensus first-team All-NFL selection once, received second-team honors twice more, and was chosen to the Pro Bowl four times.